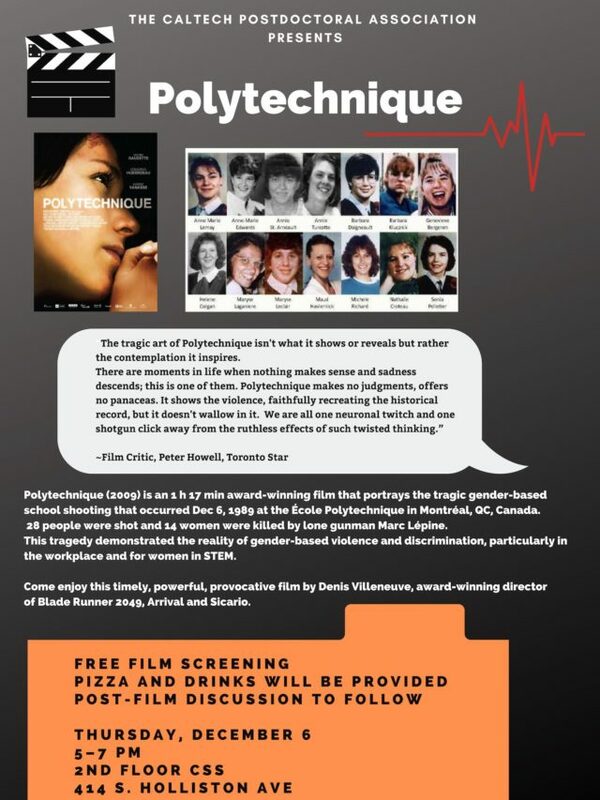 To commemorate the 29th anniversary of the Montreal Massacre, the Caltech Postdoctoral Association in collaboration with the Caltech Center for Diversity will be holding a free film screening of Polytechnique by award-winning director Denis Villeneuve. Polytechnique (2009) is an award-winning film that portrays the tragic gender-based school shooting that occurred Dec 6, 1989 at the École Polytechnique, a world-renowned engineering school located in Montréal, Quebec, Canada. 28 people were shot and 14 women were killed by lone gunman Marc Lépine. Postdocs, graduate students, undergraduates, and the Caltech community come are all invited to attend. The film is 1 h 20 min. Free pizza and drinks will be provided, and a post-film discussion will follow. Come enjoy this powerful film by the director of Blade Runner 2049, Arrival, and Sicario! “The tragic art of Polytechnique isn’t what it shows or reveals but rather the contemplation it inspires.